This year I have been lucky enough to be a part of the DEECD’s ‘Teaching and Learning in the 21st Century’ program. The premise behind it is to introduce educators to 21st century pedagogy and technologies through the use of the inquiry process. What could be understood as the ways of working, as well as the tools for working. This has involved a large amount of learning by doing for both myself as a coach and the participants I am responsible for. As a part of the program, I have mentored a group of teachers through their own project(s). The group was initially brought together around the common theme of collaboration. From there we explored, chatted and posed a range of questions online, through a range of platforms. This finally led to the formation of our driving question: “How can we use technology to enhance collaboration in the classroom?” The thought was that instead of collaborating on a big project, that we would each work on something specific to our own context. Some chose to investigate the potential of Google Apps for Education as a means for students to collaborate in and out of the classroom. While others explored the power and potential of student blogs. Throughout the process, there have been two aspects that have really challenged me. Firstly, what exactly is my place as a coach and mentor. For at times there has been little activity in the Google Community we created. Whose problem is this and what then is my role in elevating this situation? Secondly, I feel that there is a need at times to unlearn preconceived notions. One of the challenges is that it is not a traditional approach to professional development where educators are simply spoken to and told what to do or think, instead the programs involved a large amount of personal buy in. The purpose of each is to continually find a balance between learning design and space for emergence in the push to facilitate collaborative learning communities. I really liked how Stewert outlined the place of the instructor as being important, but in a different way than usual. Erica McWilliam describes this as the ‘meddler in the middle’, still their, but with a different purpose. While coming from the perspective of coaching, +Cameron Paterson borrows from Needham in suggesting the leader needs to not only enable the conditions, but make sure learning in linking back to students. The whole process has been challenging for although I have provided guidance and been present, in hindsight I fear that through my fervour and enthusiasm, I have been too present and provided far too much support, ironically undermining the space for the emergence of learning. Another coach actually allocated the role of leader to another team member, they therefore acted as a support for the support. I am feeling that this may have been a better model to push for. Associated with this need to lead without always being the actual leader, the other challenge I have faced is the need at times to unlearn. In an interesting post discussing the constant to and fro between instructionism and constructionism, Paul Dunbar suggests that at times there is a third ‘ism’ needed to evolve the learning process, what he calls ‘destructivism’. As he states, “at certain points on the learning curve, some deconstruction needs to take place before the learner can move on to the next level.” The most obvious area for unlearning often relates to the roles and expectations in the learning space. Although this does not apply to everyone, many of us have a default setting associated with professional development which involves others doing the work for us. In addition to learners needing to ‘unlearn’, I have found that instructors sometimes need to unlearn certain habits too. For as +Cameron Paterson puts forward, “if we want teachers to take ownership for their learning, the coach cannot be the expert, as this creates learned helplessness on the part of the coached teachers.” Initially I would answer every question that was asked of me, overload the space with a wide array of resources. The problem with this is that I was taking the messiness out of the whole process. After this was pointed out to me, I turned to Diigo as a place to share various resources. My thoughts were that I was still sharing, but in a way that people had to go and look for the resources if they wanted it, rather than being served on a platter. There have been some great posts relating to the challenges relating to professional development. 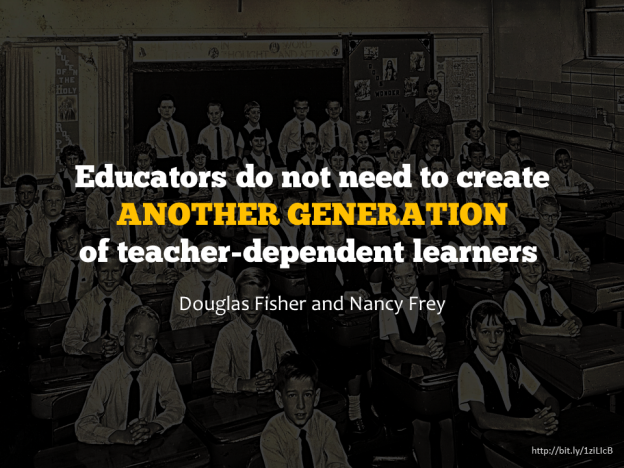 From +Steve Brophy on the connected nature of learning, to +Corrie Barclay on the endless journey of being more effective. However, the one constant is that the best learning environments are driven by us not for us. Something often easier said than done. 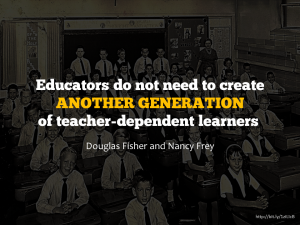 Just as Fisher and Fray suggest that we do not need another generation of teacher-dependent learners, so to do we not need another generation of leader-dependent teachers. What has been your experiences of professional learning? What worked? What didn’t? What were the biggest challenges? How were you empowered? Or empowering? Teachers are Learners Too – A Reflection on Professional Development, Being a Mentor and Teacher Inquiry by Aaron Davis is licensed under a Creative Commons Attribution-ShareAlike 4.0 International License.